On Sukkos, Masbia served hundreds of warm, delicious meals to people in need. Masbia is a non-profit soup kitchen network and food pantry. 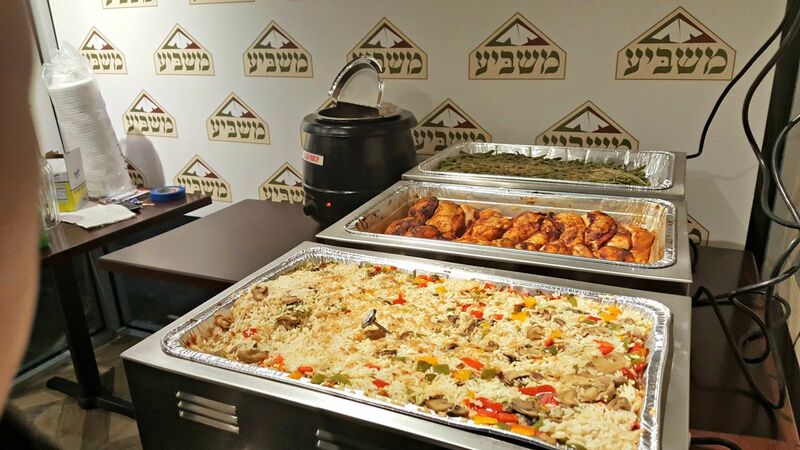 The sukkos meals were served in Shomer Shabbos Shul’s sukkah, which is next door to Masbia’s premises. For 24 hours a day, every day of the week of Sukkos, Masbia had delicious hot food ready in the sukkah for anyone who needed. The sukkah was fully stocked with nonperishable foods and snacks. Extra large crockpots were filled with fresh and wholesome hot dishes. The sukkah also boasted a fully stocked coffee and tea station. Masbia also distributed much-needed groceries to hundreds of families, in honor of the holiday. The Herzog’s from Herzog’s Wine Cellars donated huge amounts of food, grape juice, and wine to the organization. In honor of their generosity, Masbia named the sukkah where the food distribution was going on the “Herzog Sukkah”. Masbia is a nonprofit soup kitchen network and food pantry, everyday providing hot, nutritious meals for hundreds of New Yorkers in desperate need of food. Alongside our hot-meal program, we also give out bags of much needed groceries every week to those with not enough at home, through our weekend take-home package program. Masbia works to not only feed the hungry, but to provide free, wholesome, and delicious meals for people in a restaurant-style environment, with volunteer waiters serving each person with respect and dignity.